Officiating a wedding is much more than just reading from a ceremony script and offering some inspirational words. Your officiant will need to do many things. From coordinating all the elements of your ceremony — music, readings, ritual elements — to organizing the processional, recessional and interfacing with your maître d’, as a professional wedding officiant I am skilled in making sure all parts of your special day flow into one seamless whole. There are legal requirements. Several elements need to be included for your ceremony to be legally sanctioned. I am a professional, experienced officiant educated and legally sanctioned to perform your ceremony in the state or county in which that you will be married. I know what to include to make your union legal. Your wedding is a once-in-a-lifetime event. This is a moment in which friends and family gather to mark and celebrate you and this life event. 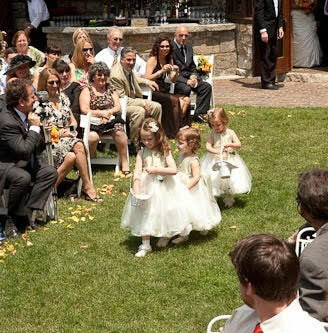 Your wedding ceremony forms the foundation for your marriage and creates your new family unit. It is important that the ritual that unites your lives has the depth and meaning needed to take you through a process to a new place – your marriage. This ritual is a peak life moment and transforms the two of you and the lives of your family and friends. You enter the ceremony as single people, and move toward the altar ready to be transformed through the words and rituals, recessing from the altar married and forever changed. Ritual has existed for a long, long time and wedding rituals are a part of every faith and culture. I believe in order to create something personal, touching, and memorable it is necessary to understand how and why these rituals and traditions came to be – to know the starting point and evolve your ceremony from there. If there is a ceremonial element you would like to include in your wedding — something from your family tradition, –I am skilled in exploring the deeper meaning with you, anchoring the ancient in today. Understanding the traditional and then diverging from there. This is essential in creating a personal ceremony that will resonate with you and your guests. Have a professional with years of experience on your team. As a legal wedding officiant, interfaith/interspiritual minister I have worked with hundreds of couples to create ceremonies that are meaningful to them and their family. My training and years of experience allow me to deeply hear you and understand your needs. Have a friend or family member participate in the ceremony. Having someone who knows you intimately speak during the ceremony is a wonderful touch. Ask a friend to tell your love story, offer a reading, or speak about your love and relationship. You can have a ceremony that is deeply personal with a professional who will get to know and accurately represent you.